My roommate’s birthday was approaching, and I knew that I wanted to do something special… something that involved food. “Dinner,” I pondered. Obviously, that idea was totally unoriginal. Then, I found a restaurant that I KNEW served one of her favorite foods—in fact, it specialized in her favorite food and was even named after her favorite food: Hummus Place. Need I say more? Although the restaurant’s title lacks creativity, its hummus was far from boring. My roommates and I ordered the hummus platter—the platter was complete with all four hummus choices in addition to pita chips and pita za’atar (we asked the waitress what pita za’atar was– it’s pita bread). Hummus, when eaten with bread, is a complete protein. It is also a low calorie food. Okay, you might want to ignore that statement when you eat as much bread as I do with hummus, but remember, we are going for a complete protein here. Forget about carbs, ladies. The hummus, rich in fiber, vitamins and even Omega 3 will make this a guilt-free meal. For vegetarians and vegans, the meal is a perfect choice. But the Hummus Place’s hummus platter is also flavorful enough to pique the interest of the most devoted meat-eaters. Masabacha, hummus made with whole chickpeas, olive oil and spices, was my least favorite. The fava hummus reminded me of a Chipotle burrito since it was topped with beans similar to the black beans. But, my two favorites were the two most unique and intriguing: first, sautéed mushroom, and second, tahini. The mushroom hummus was warm, rich and felt like healthy comfort food. The tahini hummus had a bright flavor that lent itself well to the spicy infused oil poured over the top. The weather was a little warm for the outdoor seating, but the atmosphere was too pleasant to resist. Located on the corner of Bleecker and Seventh Avenue, the Hummus Place is perfect for people watching. I enjoyed seeing bicyclers fly through stop signs, ladies click across the street in stilettos and couples holding hands as they meandered down the sidewalk in search of a restaurant. 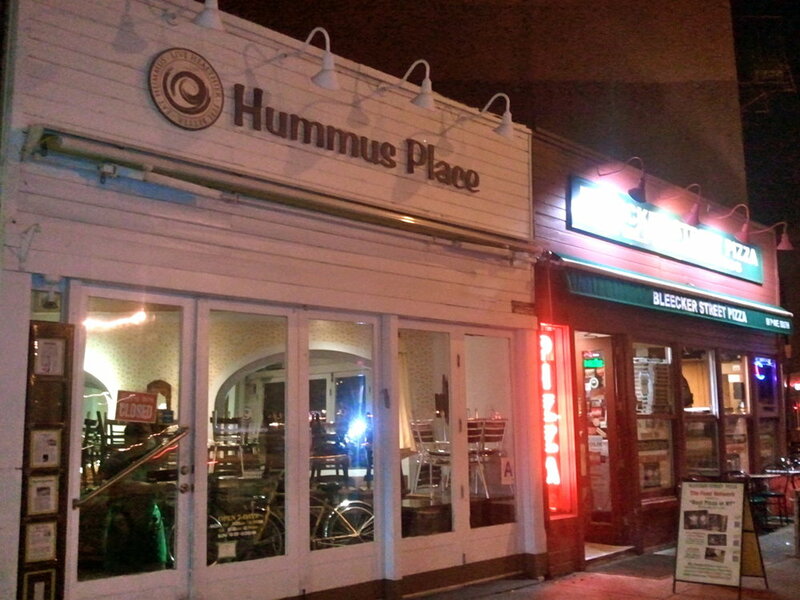 The Hummus Place is a great stop for students on a budget and a perfect way to celebrate a birthday dinner for a hummus-loving roommate. With fall weather approaching, the tables outside are the perfect weekend spot. I will note, be sure to order more pita chips. Halfway through our meal there was still a lot of hummus remaining, but we had already eaten the pita chips. Take the 1 at Rector Street from the Financial District and exit at Christopher St./Sheridan Square— you are only a few blocks away from a delicious meal.